I was lucky that I got a Sony PMW-EX3, it is one of the most popular and hotly-received professional camcorder, which can help us record vivid images and great family videos. You may have used Sony PMW-EX3 camcorder to record many high-definition footages which are in MXF video format, this video format is good for record videos, but it’s not compatible with many editing software, such as iMovie or FCE on Mac. Thus, I got some troubles when I import Sony PMW-EX3 MXF files to iMovie or FCE for their further editing on my Mac computer. Then I googled to find the Sony PMW-EX3 MXF is not recognized by iMovie or FCE. So I started looking for an easy way to bridge between my Sony PMW-EX3 and iMovie/Final Cut Express for converting Sony PMW-EX3 MXF to iMovie or FCE on Mac. But it need a top third MXF Converter for iMovie or FCE on Mac OS. Luckily, there are many MXF Converters for choosing, here I take UFUShare Video Converter for Windows or Mac as example and share it with you. The powerful Tool can not only transcode Sony PMW-EX3 MXF files to iMovie or FCE favourite video format AIC quickly, but also deinterlace the mxf files to make it more smooth in iMovie or FCE. Bellow is the Guide for you. Guide: Put Sony PMW-EX3 MXF to iMovie or FCE with best settings for editing smoothly on Mac. Step 1. 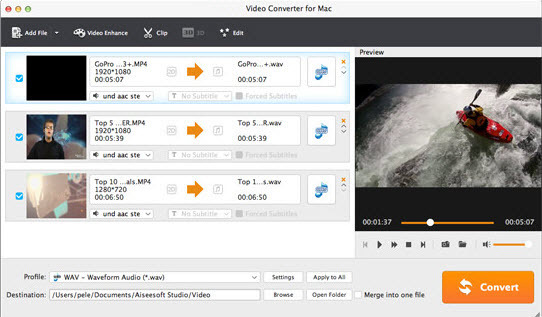 Install and launch the best MXF to iMovie/FCE Converter for Mac. Click the button “File” to add MXF files to it or directly drag and drop the files your Sony PMW-EX3 MXF files. If it is necessary, you can double click the each file to have a preview. Tips: If you have multiple Sony PMW-EX3 MXF files, you can select the “Merge into one” box to merge the files into one single file for iMovie or FCE so that you can play these files without interruption. Step 2. Click on the “Format” and you will get a dropdown menu. Move you pointer to iMovie and Final Cut Express > Apple Intermediate Codec(AIC) (*.mov). 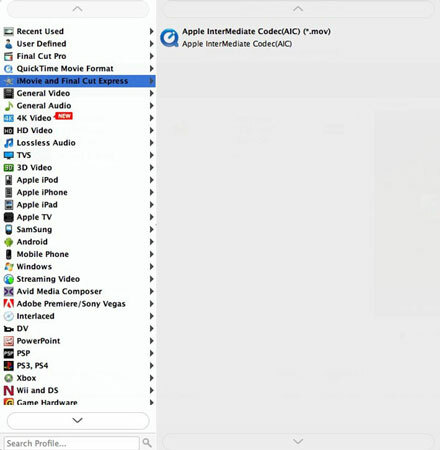 The Apple Intermediate Codec(AIC) is the compatible format for iMovie or FCE. Then you can set the output folder by clicking “Browse” icon as you need. Step 3. Click the “Settings” icon and you will go into a new interface named “Profile Settings”. Step 4. Click the “Convert” button; it will convert Sony PMW-EX3 MXF to AIC for iMovie or FCE on Mac immediately. You can find the process in the “Conversion” interface. When the fast Sony PMW-EX3 MXF files to iMovie/FCE AIC conversion process is 100% completed, you will be able to get the output files for iMovie or FCE by clicking on “import” button effortlessly. Now you can easily copy and edit Sony PMW-EX3 MXF files in iMovie or FCE on Mac with high quality without any trouble. Tip: This MXF to iMovie/FCE Converter for Mac can also help you to convert MXF file to any other playable and editable format like Apple ProRes, DVCPRO, Avid DNxHD, etc for QucikTime player, FCP, FCE, Adobe Premiere and Sony Vegas.